The 1959 Bazooka baseball card set is the most popular of all Bazooka trading card issues. It is also the most valuable. These oversized cards were issued on Bazooka boxes, needing to be removed by hand if a collector wanted to keep just the card and dispose of the box. Due to their size and positioning on the box, it was difficult to remove the cards without damaging them. As a result, high-quality examples have become hard to come by for the collector today. In the following article, we take an in-depth look at this classic baseball card issue. Click here for more. Bobby Hull - Collecting "The Golden Jet"
Bobby Hull, "The Golden Jet," remains one of the biggest names in hockey and the hobby. Owning one of the most powerful slap shots in the sport's history, Hull became a prolific scorer, racking up more than 600 goals in his career. Hull's history on cardboard began in the 1958 Topps set. On the issue's last card - #66. This card, due to its placement on the sheet, was often produced with marginal-to-poor centering, making it a condition rarity. In the following piece, we take a look at Hull's career through the cards collectors desire most. Click here for more. Vintage boxing card sets, including many of the tobacco issues from the early part of the 20th century, are extremely collectible and tough. This 50-card set is modest in size but the classic pugilist issue contains several Hall of Famers and a very attractive design. Some of those names include Jim Corbett, James Jeffries and - of course - the key to the set in John Sullivan. There are even several combo cards that showcase two boxers during noteworthy fights including one of Sullivan, along with Jake Kilrain. This year's winner carries a GPA of 7.04, which makes it the finest complete T220 set ever assembled on the PSA Set Registry. Click here for a look. Among some amazing cards, Goodwin & Company's auction offers over twenty-five T206 Hall of Famers and commons graded PSA 8 or higher, led by the one and only PSA 8 example of Hall of Famer Jake Beckley. Football fans will find a beautiful 1956 Topps set with a minimum grade of PSA 8, a 1952 Bowman Large #72 John Schweder and the highest graded and only PSA 8 1948 Leaf Charley Conerley rookie card. Click here to read more! The latest major Clean Sweep Auction may well be one of the best auctions in its history. Included are many important and rare pre-World War Two baseball card sets, terrific graded cards, an amazing selection of baseball autographs spanning almost 100 years and choice memorabilia from all of the major sports, including Eddie Lopat's 1949 World Series ring and a stunning 1930 Notre Dame completely signed yearbook with Knute Rockne. Click here to read more! Three ultra-high grade baseballs signed by Babe Ruth are among the featured attractions in Memory Lane's upcoming I Own it Now catalog sale of top end sports memorabilia. The baseballs, which date from the late 1930s through the final year of the baseball legend's life, represent three of the best single-signed Ruth baseballs in the hobby. For more, click here. This auction features many high grade and low pop cards for collectors to complete their sets from the 1950s through the 1970s. There is a nice run of 1967 Topps baseball with a lot of 8s & 9s. Click here to read more. 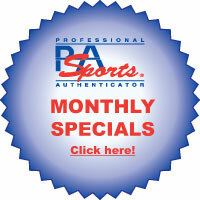 SportsCardLink's September Auction Is Now Underway. Closes Thursday, September 20, Starting at 8 p.m. This auction, held on SportsCardLink.com, features important sports cards from the late 1880s to the mid 1980s, with a tremendous range of low, middle and high grade cards that will be sure to excite any sportscard collector. Of particular note are two large collections of cards from "The Monster" - the great set known to all card collectors as T206 White Border. For more, click here. There are several baseball players having terrific seasons but which of the following players do you feel will get the biggest hobby boost if they should be named MVP of their league?